Be the first to review this 2018 Mazda MX-5 Miata. The Mazda MX-5 Miata has an unbroken winning streak of successful redesigns since 1990. 2018 is the third model year for this fourth-generation version, referred to internally and by enthusiasts as the ND. 2018 MX-5s get a 7.0-inch infotainment center as standard equipment, and offer an optional red convertible top and optional Recaro seats. There’s also a new package with Brembo front brakes and BBS wheels. 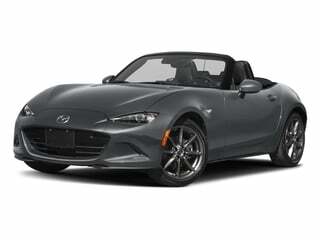 The 2015 redesign marked a return to Miata sports-car roots: a lightweight, rear-wheel-drive, two-seat roadster. It’s simple, straightforward and traditional. Like a classic British MG or Austin-Healey from the ’60s, only better. This latest-generation MX-5 is the best ever. It is truly a delight: nimble and fun to drive, whether in curves or on city streets. You can drop the manual top while belted in the driver’s seat, even while at parking-lot speeds. And if a thunderstorm occurs, you can pull it up and latch it just as easily, without getting out of your seat. The Miata RF gets a retractable hardtop roof that gives it a fantastic fastback appearance. And it’s not just stylish, it’s stiffer and quieter than the soft top. Looks are more contemporary and a bit more aggressive than the previous generation. The wheelbase is a bit longer at 91.1 inches, but it’s slightly shorter at 154 inches and slightly wider at 68 inches. It weighs just 2331 pounds. The MX-5 is powered by a simple 2.0-liter, 4-cylinder engine making a modest 155 horsepower, but that light weight enables it to accelerate from zero to sixty in a solid six seconds flat. It’s available with either a 6-speed automatic or 6-speed manual gearbox. We like the manual because it’s perfect in a car of this character, but the automatic works well in Sport mode and is much less work in the city. Its main rival might be the Fiat 124 Spider, which is built on the MX-5 platform in a joint Mazda-Fiat venture. It has its own styling with an Italian flair, and uses a smaller but slightly more powerful engine, a turbocharged four. The MX-5 is more refined, which isn’t surprising, but it also looks better and handles with more precision, which might be surprising, since beauty and cornering are what Italian cars are known for. Fuel mileage is excellent, with the 6-speed automatic getting 26 mpg city, 35 highway and 29 combined; while the 6-speed manual is rated at 26/33/29 mpg. That’s about what we got in one week behind the wheel of an RF with the retractable roof. Mazda MX-5 models are the Sport, Club, and Grand Touring, in either roadster or retractable roof RF. Standard equipment includes four airbags, anti-lock brakes, stability control, LED headlights, keyless ignition, cloth upholstery, and a leather-wrapped steering wheel. Club adds blind-spot monitors and rear cross-traffic alerts, while the Grand Touring adds lane-departure warnings, and automatic dimming headlamps that that curve into turns. Automatic emergency braking is unavailable. Club also features a sports suspension with Bilstein shocks and high-performance tires, and upgraded cloth upholstery. Grand Touring adds leather-trimmed seats and navigation. The MX-5 is small and tidy. The beltline is curvy, the hoodline plunging, and the mouth is huge. Unfortunately, depending on the state, a license plate might be mounted there, making it look like an open mouth with one tooth. The cabin is classic and tidy, with big analog gauges and round climate vents. A prominent center console keeps the driver and passenger in their separate spaces, while the new 7.0-inch screen sits on the low dash. The MX-5 offers superb dynamics, with handling that is predictable and precise. The redesign moved the roll center closer to the driver, which can especially be felt in switchback corners: left-right-left, as balanced as can be. It can be made to oversteer, with turning and braking at the same time; but pushed to its limit, the tires don’t suddenly lose their grip. Driving the MX-5 is confidence-inspiring; fun and satisfying. The Club model, with its Bilstein shocks and grippier tires, delivers the sportiest handling. The ride is firm but still nice. Bumpy city streets aren’t annoying. Even the Club with its firmer suspension is easy. With a modest 155 horsepower and 146 pound-feet of torque, the power isn’t exactly over the top; but with only 2300 pounds to pull, the MX-5’s acceleration is still sprightly. It can zoom-zoom from zero to sixty in about 6 seconds. And it does so joyfully. It’s free and smooth. We like both transmissions, but the six-speed manual gearbox is more fun, partly because of the freedom of the engine, but more because it’s so easy to shift. The clutch is light and the gears slot into place neatly. Rarely has a sports car been so easy to heel-and-toe downshift, with that blip of the throttle coming so responsively from the engine. But if working a clutch pedal and lever isn’t your thing, the six-speed automatic transmission with Sport mode does the job of shifting exceedingly well. The MX-5 is the most fun you can have in an everyday sports car. It’s virtually flawless. Stylish looks, superb handling, responsive and user-friendly powertrain, clean cabin, and affordability. The classic roadster’s top could not be easier to raise and lower, while the RF’s fastback hardtop makes the MX-5 look like a car costing twice as much. 2018 Mazda listings within 25 miles of your ZIP code. Find 2018 Mazda listings for sale near you.